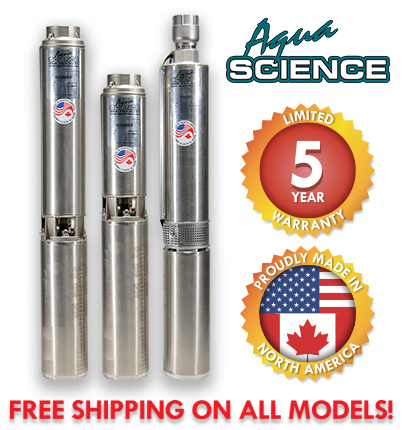 Aqua Science is proud to offer the new SS Series, 4” Super Stainless submersible well pump powered by a proven performer, the Pentek XE motor. For high flow applications, we now offer the SSH Series, 4” High Flow line with flow rates up to 80GPM. This pump offers unsurpassed quality and performance at a price you won’t find anywhere else. Built with a 304 stainless steel discharge head, motor bracket, and housing, expect years of trouble-free operation. The SS and SSH Series both have a full 5 year warranty.